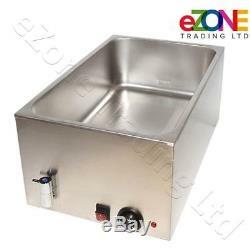 Atosa Wet Bain Marie With Drain Stainless Steel Food Gravy Sauce Electric Warmer. 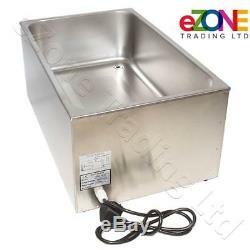 Is a robust Bain Marie with Mechanical Controller and drain tap. Ideal for safely holding sauces, gravy, and pre-cooked foods. 560mm (w) x 360mm (d) x 240mm (h). Atosa provides a quality range of catering server sundries, ideal for all styles of catering, great for buffets and restaurants. Well designed and stylishly made of top quality steel and able to cope with the pressures of a busy environment. 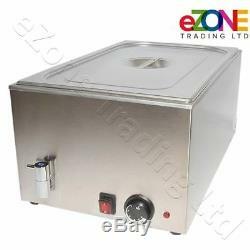 10 Litre capacity holding tank stainless steel. Easy to use temperature control. Adjustable heat control gives added versatility. Rated voltage: 230v - 50hz. Size: 560mm (w) x 360mm (d) x 240mm (h). All our parts are brand new , in stock and sent same day from our warehouse in Stockport UK; place the order before 4PM and your parts can be with you next day. See our feedback left by 1000s of satisfied buyers HERE. 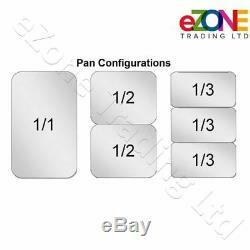 For more catering spares and parts eZone Trading Ltd, Company Registration No. Please note our next day service may not cover certain remote areas such as highlands, islands and Northern Ireland. Please check your postal coverage before completing the order. Recorded and Next day service will require a signature. All items should be unpacked and checked for any damages before being signed for as any subsequently reported damages we can not be held responsible for. We are not liable for any losses resulting from delays or missed deliveries. The item "Atosa Wet Bain Marie With Drain Stainless Steel Food Gravy Sauce Electric Warmer" is in sale since Friday, December 14, 2018. This item is in the category "Home, Furniture & DIY\Cookware, Dining & Bar\Pots & Pans\Saucepans & Stockpots". The seller is "ezonetrading" and is located in Stockport. This item can be shipped to United Kingdom, Antigua and barbuda, Austria, Belgium, Bulgaria, Croatia, Cyprus, Czech republic, Denmark, Estonia, Finland, France, Germany, Greece, Hungary, Ireland, Italy, Latvia, Lithuania, Luxembourg, Malta, Netherlands, Poland, Portugal, Romania, Slovakia, Slovenia, Spain, Sweden, Australia, United States, Canada, Brazil, Japan, New Zealand, China, Israel, Hong Kong, Norway, Indonesia, Malaysia, Mexico, Singapore, South Korea, Switzerland, Taiwan, Thailand, Bangladesh, Belize, Bermuda, Bolivia, Barbados, Brunei darussalam, Cayman islands, Dominica, Ecuador, Egypt, Guernsey, Gibraltar, Guadeloupe, Grenada, French guiana, Iceland, Jersey, Jordan, Cambodia, Saint kitts and nevis, Saint lucia, Liechtenstein, Sri lanka, Macao, Monaco, Maldives, Montserrat, Martinique, Nicaragua, Oman, Pakistan, Peru, Paraguay, Reunion, Turks and caicos islands, Aruba, Chile.